Paints, Primers & Sealers Archives | Unitex® Your Walls, Our Pride. Unitex® Paints, Primers & Sealers are specially designed for use as part of Unitex Coating Systems for interior and exterior walls. Manufactured in Australia, for Australian conditions. 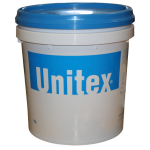 Unitex Paints, Primers & Sealers are suitable for use as part of systems as per written specifications and Unitex Installation Manuals. Contact our team to discuss your project requirements, and select the best product system.